@Hejix - Wow, that's really clever! You can play the TSM kingdom as the inner, imaginary landscape / pretend alter-ego of the child. That's brilliant! @sindocat Thanks. I really like to play parallel games, it is longer to play, but it moves both story lines simultaneously and make them more meaningful. Big fun! I may adapt it myself, and have my Ambition-free sandbox version of Kingland be the stories my writer Sim writes! Read all the posts in this thread, the pictures and stories are fantastic! It truly shows the potential of the game. I'm thrilled to play again, with more insight. @Hejix - Well, that turned out to be a great idea! In my Sims 3 game, my werewolf dad, Teague, had already finished his Lifetime Wish to be top of the Law Enforcement career (International Super-Spy) and retired, and then rolled a wish to join the Writer career. I'd poked about with comic books, with the notion of them being civics magazines for the Scouts program, but that wasn't very satisfying. 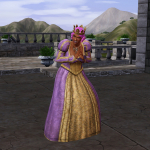 Your notion of Sims Medieval being the imaginary kingdom of a child playing at being Royal was inspiring. So far, Teague has written several children's books: King Simrey the Young, Brother Jevon's Abbey, and Rolando the Spy. Currently in the works is Devon the Smith, and upcoming titles in the Chronicles of Kingland include The Sisters on the Hill, Sister Bethicca, Healer and Meaghan the Enchantress. If I run out of books to write before I have added new Heroes to my current game, I can write Hamfast the Hungry, Brother Jevon and the Chinchillas of the Wood and The Tall Oaks of Burdley, based on recent TSM play. This is helping me not only move Teague's Writing career along - children's books don't pay very well, but are fast to write - it is also helping steer me through a "canon" iteration of Kingland, as I decide which Heroes I want Teague to portray. Some never vary - Thiobalt is always my bard - but others do. I wanted the story dynamic of my estranged Physician and Witch sisters, so Meaghan it is, rather than Barnabus, my male mage. I also plan to use my female Knight (to feature in Dame Valora the Bold) and Merchant (Averil, a Merchant of Kingland) on down the line. Augustin of Jacothia will be the last Hero book, because I dislike Jacobans. Max has already read King Simrey the Young, having rolled a wish to Finish a Book. Sadly, offering praise for a written work seems not to be a kid interaction. But the collected Chronicles of Kingland are all going in the bookcase in the kids' room, as they are written. It's great to have an idea of how, exactly, my TSM play penetrates the world of my TS3 game, and has made it more fun to play both. Thank you! @Sindocat Wow! Kingland forever, indeed! ;D Thanks for sharing! 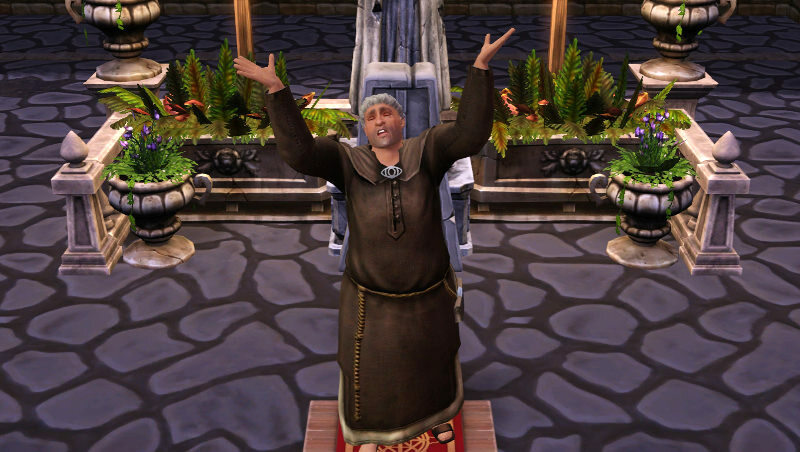 You make me want to go back to sims medieval. I only scratched the surface so far, but your enthusiasm for that game is contagious! I will, however, finish George Dean's story first (pondering on public services in Riverview as he is a cop and plans to be a firefighter). I think he'd make a wonderful knight in Catherine's game. Also, do you have the dragon valley world in sims 3? I'm planning to use it as well. It was my plan b if I would not be able to install sims medieval. I do, indeed! One of my legacy families started there, though I seem not to have documented it well, and I have a household I play there - a fairy Knight, his squire, and their (surprise!) twins, but I only play it when I have Pets loaded, as it's an equestrian household. I have always been vaguely disappointed that TSM doesn't have horses (how can you have chivalry without a cheval? ), and that Dragon Valley doesn't have swordplay, but I understand the limitations. TSM was originally floated as an expansion pack for TS3 (why it uses the same engine) but ended up being spun off as a separate game. I get the feeling that a lot of Dragon Valley and Duke of Bows assets were originally designed with the abandoned EP as their intended outlet. There is a fair amount of overlap, for sure! 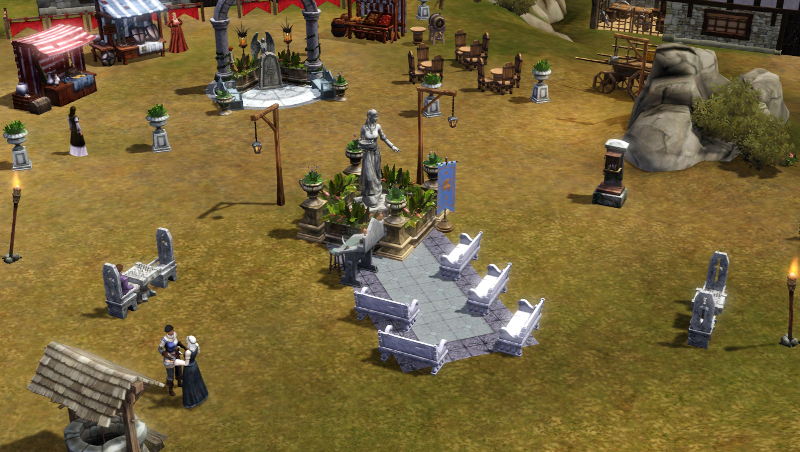 After completing "Dangerous Minds" along the educational track in my "eternal" iteration of Kingland, I decided to (re)decorate my Town Square, not only restoring the Hamfast Memorial I had raised there in the early days, but expanding it in front to indicate where classes are held for Kingland's children now that regular schooling has been instituted, thanks to the efforts of His Majesty, King Simrey XIII and the generosity of Merchant Averell. (In the background, Averell's ostentatious Jacoban arbor, in the middle of the marketplace). Your town square is lovely, @Sindocat! Nice job!! !